One of the times I saw Paul Kelly in Wellington, someone down the front kept yelling out for some particular song [I think it may have been ‘Darling It Hurts’]. Kelly ignored him but the guy got louder, drunker, angrier, till eventually Kelly looked down in his general direction and muttered, ‘A man is not a juke box’. It was a marvellously witty but firm and above all dignified riposte. I thought of it today, listening to Wallace Chapman interview Kelly on National Radio. The thing is, Kelly is a jukebox, of a kind. His autobiography, which came out a few years back and which I re-read last year as part of my post-election de-tox, is a music fan and music philosophers’ book: a fan not just of Kelly’s music but his own, and other’s influences. There are pointers about music, how it works and how it does not – on his own ‘Before Too Long’ – a demi-hit off the ‘Gossip’ album in 1987 – he notes it the chords move quickly from one to another and serving to “lock” the song. Gossip was the first album of Kelly’s I bought and like the Lucinda Williams one referred to a few posts back, was a rare purchase made on the strength of one song – in this case, ‘Maralinga’. The thing about How to Make Gravy is how much it is about other people’s songs. 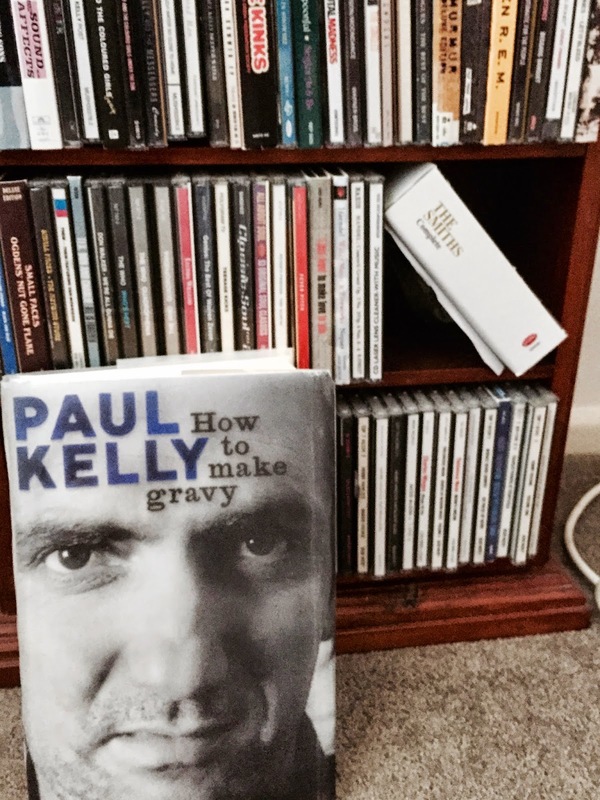 Kelly is generous in giving tribute to other influences, both recorded and in life (other musicians who encouraged him included Cold Chisel’s Don Walker and New Zealand ‘s own songwriter of Dragon, the late Paul Hewson. A chapter named after his own ‘Don’t Start Me Talking’ – a personal favourite of mine – delves off into great first lines in songs. ‘Dante, Dickens, Tolstoy and Morrissey knew how to begin. In the middle of the journey of my life I found myself in a dark wood. It was the best of times; it was the worst of times. All happy families are all alike, all unhappy families are unhappy in their own way. Sweetness, sweetness I was only joking why I said by right you should be bludgeoned in your bed. He also cites lyricist Hal David and laments David doesn’t get the same kudos as collaborator Bert Bacharach. Or Aretha Franklin’s ‘the moment I wake up, before I put on my make up, I saya little prayer for you’ – and he comments how it is difficult to imagine a man wrote those lines. It’s a technique which, as Kelly shows, grabs the listener by the elbow – “You can’t help but lean forward on your seat to catch up with what you’ve missed and what will happen next”. He does the same with his own ‘Don’t Start Me Talking’ – title taken from bluesman Sonny Boy Williamson, with an acknowledged debt to Elvis Costello’s ‘Oliver’s Army’. “As Homer well knew, a good steal is worth stealing again,” he comments, with a mix of honesty and cheek. There are nods to Australian bands he learned from, and he writes about these magnificently: the Triffids and their ‘great cathedral of a record’ ‘Born Sandy Devotional’ – the description captures ‘Wide Open Road’ the best song off that album, perfectly. Or the Go Betweens ’Cattle and Cane’ which he first heard on a car radio and had to pull over to the side of the road: And having to pull over to the side of the road. He writes of what he calls ‘circle songs’ – “the melody of the chorus changes but the chords don’t. There is a tendency, often, to write more of the imaginative world of other people’s songs than Kelly’s own, at times – he often borrowed titles of famous songs by other people and given them a while new twist – – Etta James ‘I’d Rather Go Blind’ is one: Billy Holiday’s ‘Don’t Explain’ is another. That’s a paragraph which captures the whole mood of the book: appreciative of others’ talent and explaining his own works, with both on a bedrock of sheer generosity of spirit. There is a comment, somewhere, about making mixed tapes for other people, and how it means more than making a mixed CD because you have to listen to the songs as you put it together. That is this book: it is the written equivalent of a mixed tape. He has tips, too for rising musicians: he and his band, the Coloured Girls, toured the US in the 1980s, with the thankless job of opening for much better known acts. ‘Sing to the shy Goths’ in the audience, he advises: they usually write the reviews for the local paper. There is bemusement that, these days, schools now study his lyrics and he gets invited along to talk about them, recalling Irish poet W B Yeats’ late poem about similar experiences as a “a public smiling man” and feeling out of place in the role. “I know some of them want little packaged answers they can serve up in exams – the themes of the work, the making of the songs all that guff. I ramble, I digress, I I loop-around. Offering expansion, not reduction. I want to set off little bombs in their brains. “…Connect. That’s what I want to say to the mixed rows of young faces in front of me, some earnest, some giggling, some bored. …..